It is easy to find, cast and manage Actors on the In The Picture platform. We offer you the opportunity to look for people in our general central database or in your own private database. Within those work environments, you will find acknowledged actors who fit a certain description in no time. Not only do you have access to their up-to-date profiles, our software provides various options to organize (online) castings as well. Our database contains a wide range of actors who maintain their own profile and are acknowledged as actors by our team. It is also possible to create your own private database, to which you can add profiles manually or let people subscribe via your website or social media. Next, you are able to evaluate each talent and add information, photos and videos, which are only visible to you, to each profile. With our advanced search tools, the system looks for actors who fit a certain role. Finally, organizing a casting was never so simple: by using automatic timeslots, Actors can choose for themselves what time they want to come by and everything is kept in well-arranged lists. Casting videos can be sent and viewed online as well and you can add an evaluation immediately. In short, In The Picture offers different tools to find, cast and manage Actors, such as advanced filters, online video castings, personal labels, casting lists with automatic timeslots, export functions, added evaluations and many more, all to help you save time throughout the whole process. In The Picture is the ideal system for collecting and following-up the right people for various roles. From a waiter with lines to passengers on the street: you can count on our general central database or your own private database. With one simple click, you book a person and add them to a list. This way, we provide a well-arranged structure to manage multiple roles simultaneously. Furthermore, our software offers different tools to follow-up on each individual, while minimalizing the manual work. In your search for the right person for a certain role in our database, advanced search tools allow you to filter on all the possible profile data like region, age, gender, but also color of hair or eyes, clothing size, special competences, and so on. You can choose to look manually for the right profiles or to let people who fit the description subscribe by themselves. The ones you decide to book, appear in a list per role. 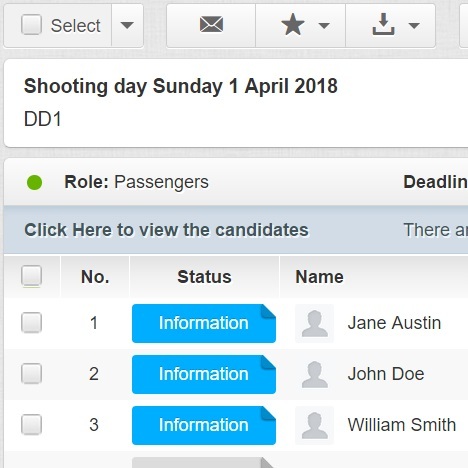 This way, it is possible to manage different roles at the same time and know exactly who is in need of what information, who has to be where and when, who gets which compensation,... On our platform, it is easy to create a structure of shooting days and roles, in order to keep an oversight on your whole project. Because of this clear overview, you can efficiently work together with colleagues as well. The In The Picture software is adapted to the specific requirements of your search for Candidates for quizzes and reality shows. You can share your call for candidates with our general central database or spread a custom tailored subscription form on your website or via social media, which links to your private database. Furthermore, there are various tools at your disposal to facilitate the selection procedure and the follow-up of all the candidates. While searching manually for suitable candidates in our database, you can choose to filter on all possible profile data like region, age or gender, but also color of hair or eyes, clothing size, special competences, and so on. It is possible to create your own subscription form as well and to spread this form using your website or on social media: everyone who fits the description can subscribe directly to your own private database. Using our software, it is easy to make advanced questionnaires, to which people can upload photos and videos. In The Picture permits couples to subscribe together and to link their profiles. Finally, all the subscriptions are collected in a list of candidates, where you can easily maneuver between the different profiles. You can use evaluations to make a selection or add statuses to keep track of whom you contacted yet, all while working together with colleagues. With In The Picture, you can collect an Audience for your project in a quick and organized way. You can collect your Audience using our general central database, your private database or share it via your website or on social media to reach even more people. Our software helps you follow-up on all these individuals by sending out automatically adapted mass messages and many other options. Whenever you’re in need of an Audience, you can easily submit a call to the extensive database of In The Picture. You may also choose to share a subscription form on your website or on social media, which helps to reach an even bigger mass. Subsequently, subscribers will appear in your private database. It is possible to collect all individuals in a list of candidates to select from as an Audience or to book them all immediately. The system provides an automatic confirmation message to those who are booked for example, or the possibility for people to bring friends and family. In the bookings lists, you can add follow-up statuses to check who is in need of which information, which annulled bookings need replacement, and so on. Finally, with exported day lists or using your laptop or tablet, you can check off who’s present on the shooting day. Within the In The Picture database, it is possible to create even more categories by yourself. 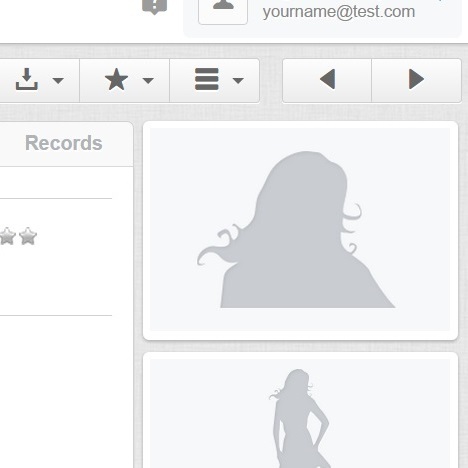 You can add labels like ‘models’, ‘characteristic faces’, ‘dancers’, ‘performers’, ‘hosts’ and so on and apply these to profiles. This way, you’ll find the right talents for your project within a few clicks. Consequently, our software can be used for many different calls. The extensive amount of people in our database is also reachable when looking for locations, vehicles, animals and much more.